A family owned vineyard and winery dedicated to the production of estate grown Pinot Noir located on the western edge of the Chehalem Mountains AVA. Proprietors Joe and Vicki Stark acquired an ideal site for Pinot Noir two miles from their rental home, made possible by Joe's successful DMH, Inc. cabinetry business. The Winemaker is the former Assistant Winemaker at Beaux Freres, Steve Goff. The Wine Director is Mark Bosko, who was the Wine Director at Press Wine Barr in Dundee and the previous Tasting Room Manager at Domaine Drouhin. 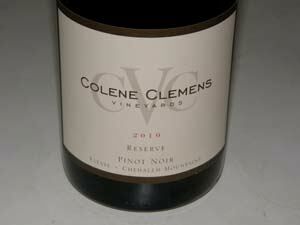 The first Pinot Noirs were released from the 2008 vintage from their initial 23 acre estate vineyard. A tasting room has a breathtaking 360-degree panoramic view of Bald Peak to the north and the Coast Range to the west. Sunset Magazine named Colene Clemens a 2011 Western Wine Awards Finalist for "Most Beautiful" Winery Tasting Room of the Year. The tasting room is open Wednesday through Sunday (May-October) and Friday through Sunday (November through April) at 22501 NE Dopp Rd. in Newberg.